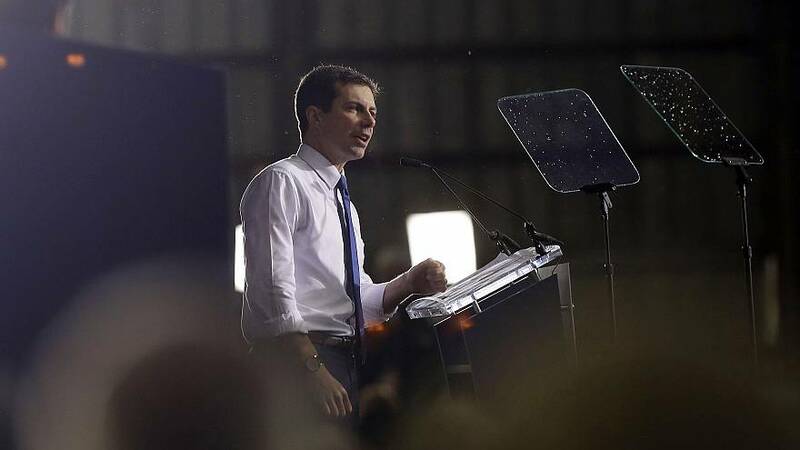 "We're snapping into action," Buttigieg told NBC News during a recent campaign stop in Concord, New Hampshire. "We have to." He said he was bringing in a "much bigger team" including "boots on the ground in the early states" and a larger headquarters operation to sustain the campaign into the summer and fall. Still, he added, "We're always going to work to be a lean and scrappy operation. That's just our style." "You've just got to get muscle memory of people who've seen it before — ballot access in early states, organizing in different constituencies," he said in an interview on "The Rachel Maddow Show" Monday night. "And there are other things that I think the playbook really is changing." Spearheading Buttigieg's campaign in the early stages has been campaign manager Mike Schmuhl, a high school friend who served as his mayoral chief of staff. Schmuhl, who was a year behind the 37-year-old mayor in school, ran Buttigieg's campaign for mayor and a congressional campaign for former Democratic Sen. Joe Donnelly, but does not have experience at the top levels of a presidential or even a statewide campaign. Buttigieg's communications guru, Lis Smith, does have extensive presidential campaign experience, including as rapid response director for former President Obama's 2012 re-election and deputy campaign manager in 2016 for former Baltimore Mayor Martin O'Malley. Buttigieg campaign officials said dozens of new hires are expected in the next few weeks, bringing the current team of 30 to roughly 50 by the end of April. Although the campaign already has an operations team and an "advance" team, which arranges logistics for campaign stops, those will be augmented by state-based leadership teams in five early states, including Iowa and California, with more to come later. "We're constantly going to be trying to strike a balance between sort of traditional best practices in political campaigns with something new, fresh, disruptive technology that will set us apart from the rest of the field," said Schmuhl, the campaign manager in an NBC News interview. But there's a potential disadvantage to the fact that Buttigieg's sudden ascent and late formal entrance into the race, which came after the primary field had mostly been set and his competitors had already been campaigning for months. Much of the top campaign talent in the Democratic Party have already committed to other candidates, leaving Buttigieg fewer options to choose from — a challenge former Vice President Joe Biden may also face if he gets into the race. Ryan Williams, a Republican strategist who worked for Mitt Romney's 2012 presidential campaign, said the risk for Buttigieg in having too lean a staff and organization is that a once-promising contender can abruptly collapse, particularly if the candidate errs and has insufficient tools to back him or her up. He pointed to Democrat Howard Dean, whose 2004 campaign appeared to be rocketing upward until it crashed down to earth after a notorious "scream" by the candidate at an Iowa rally. "You can be an inspiring candidate and lose by a few percentage points. You can have a great field operation, but an uninspiring candidate will lose," said Williams, now at the firm Targeted Victory. "Organizing, literature drops, phone banks, door knocks -- that ground game will get you that final two or three points in a race." "There's been a lot of people that we've hired over the last few weeks who said they were going to sit out 2020," Schmuhl said. "But they're jumping right in, because Pete's their candidate."